Each year our school community works hard to raise funds for various charitable causes - from small independent local charities such as food-banks, to large international organisations. Non-uniform days, cake sales, bag-packing and sponsored sporting activities are just a few of the creative methods students use to raise money. In a world where there is enough food for everybody, hunger is still the biggest threat to health. 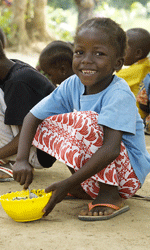 Children are particularly vulnerable – there are 300 million chronically hungry children in the world. Hunger kills millions of them each year. It also stunts their growth – and their dreams. Hungry children think about survival, not about going to school – around 67 million of the world’s hungriest children do not attend school. Instead, in order to survive, they have to work whether in the fields or on the streets. Even if they do make it into the classroom, hunger will affect their ability to learn. Mary’s Meals has a simple ethos. We deliver food and hope. By providing one good meal to hungry, impoverished children every school day, we are filling their empty bellies so they have the energy and opportunity to learn, which can be their escape route out of poverty in later life. 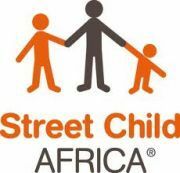 Street Child Africa is a small charity committed to helping street children in Africa. And whilst we may be small, we are determined to make a big difference. So far we have raised over £6 million. Our vision is a world where all African children are safe, loved and reach their potential. We work with local partner organisations in sub-Saharan Africa to support children in street situations. These children are denied access to education, excluded from healthcare systems, and overlooked by national development strategies. We aim to engage, empower, and educate children who are often uncounted and unheard. We are working to give street children a safe place to learn, play, and grow. We fund twelve grassroots organisations in eight countries from our office in Thames Ditton, Surrey. Every organisation we support is dedicated to improving the lives and long term prospects of children. We help children in street situations to realise their rights and their potential, because their potential is our inspiration. The school presented a cheque to Maureen Hickey, of Archbishop Ilsley School at Campion Mass 2012. She has for many year been an avid supported of Street Child Africa and has raised many thousands of pounds for their causes. Father Hudson’s Care is the Social Care Agency of the Roman Catholic Archdiocese of Birmingham, covering the counties of Staffordshire, Worcestershire, West Midlands, Warwickshire and Oxfordshire. The society offers services to people in need, in order to improve their quality of life. Christ’s command to “love one another as I have loved you” underpins our work with children, young people, adults and families, without favour or discrimination. The Duchenne Children’s Trust are working to find a cure for Duchenne Muscular Dystrophy in ten years. Duchenne Muscular Dystrophy is the most common genetic killer of children worldwide. It is 100% fatal. There is no cure. But recent scientific breakthroughs mean that for the first time, there is hope. Hope and belief that we can End Duchenne in Ten. The school became involved with The Duchenne Children’s Trust via Ben Smolden, one of their patrons and an Olympic Torchbearer who worked with us during the London 2012 Olympic games and was guest of honour at our 2012 awards evening. Ben gives selflessly of his time to many charities, including this one, raising awareness and much needed charitable funds. Tyburn Convent is a monastery situated right in the heart of London. It is a cloistered community of Benedictine contemplative nuns who live by the ancient monastic Rule of St.Benedict. The charism or work of the community is prayer. Tyburn Convent is the Mother House of monasteries world-wide. The Foundress, Marie Adele Garnier made Tyburn Convent the home of the famous shrine of the English Reformation Martyrs of Tyburn and its museum contains relics of some of the many men and women martyred for their faith during the Reformation. 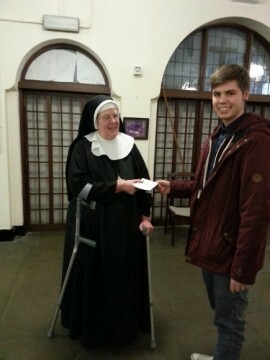 During a previous visit, our school presented Mother Lioba, with a cheque to further the charitable work of the convent. 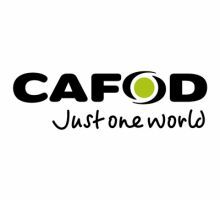 At CAFOD, our mission is to work alongside the world’s poorest people. We work without prejudice, we don’t preach, and we pride ourselves on our diversity. We believe our Catholic values are best shown through working for justice and an end to poverty. 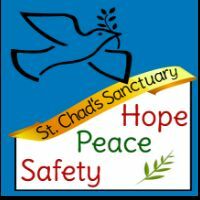 St. Chad’s Sanctuary is a voluntary project supported by St. Chad’s Cathedral and The Salvation Army. It’s a place of welcome and hospitality for Asylum Seekers, Refugees and Immigrants. SIFA Fireside was formed in 2007 through the merger of well established Birmingham charities: SIFA (Supporting Independence from Alcohol) set up in 1982, and the Fireside Charity set up in 1983. Collectively we have been delivering services for over 30 years.